Global Health refers to ‘those health issues, which transcend national boundaries and governments and call for actions on the global forces and global flows that determine the health of people’. Since is establishment in 1948 the World Health Organisation (WHO) has been one of the primary actors in driving the health agenda globally and remains the only body able to create legally binding treaties (there are currently two; the Framework Convention on Tobacco Control (FCTC) and International Health Regulations (IHR)). 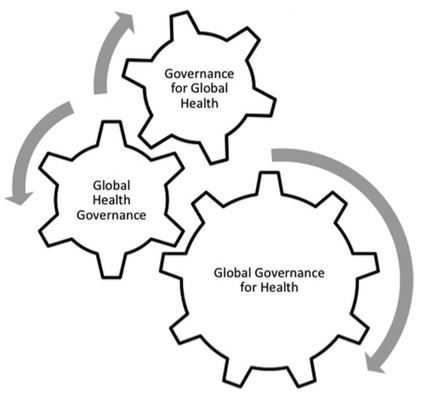 Kickbusch & Szabo  set out the transnational and cross-cutting nature of governance in the global health domain along three political spaces: Global Health Governance, Global Governance for Health, and Governance for Global Health. 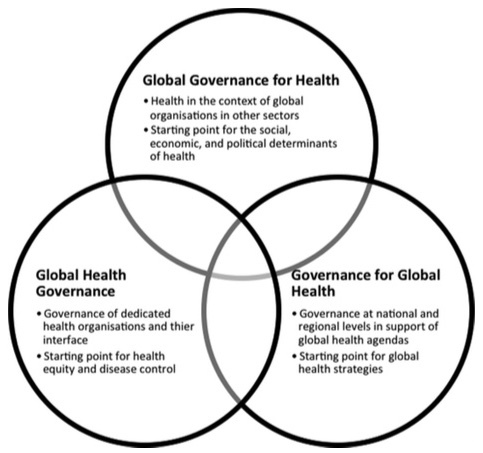 They suggest that in order to keep global health firmly on the political agenda, and to strengthen action on the determinants of health, reform and strengthening of the governance institutions in all three of these political spheres as well as how they interface is critical. Global health policy is now being influenced by an ever-increasing number of nonstate and non-intergovernmental actors to include influential foundations, multinational corporations, multi-sectoral partnerships, and civil society organizations. Kelley  examined the current architecture of global health governance including the World Health Organisation, various United Nations Agencies and the role of International Non-Governmental Organisations. Finally Kickbusch  examines the changing context for Global Health and with the advent of the agreement on the Sustainable Development Goals identifies some key questions in relation to Global Health Governance that still need answering. How will responsibility for our future be distributed as power is diffused? What political mechanisms will we have at our disposal? Can the commitment to the SDGs help build a new UN? Monitoring of health situations and trends. In September 2000, building upon a decade of major United Nations conferences and summits, world leaders came together at United Nations Headquarters in New York to adopt the United Nations Millennium Declaration, committing their nations to a new global partnership to reduce extreme poverty and setting out a series of time-bound targets, with a deadline of 2015, known as the Millennium Development Goals. According to Kelley  the 3 Health-related Goals of the Millenium Development Goals, highlighted below, have directly provided high-level, consensus to global health policy direction and played a key role in moving Global Health forward. In September 2015, the Assembly agreed on a further set of 17 Sustainable Development Goals, contained in the outcome document of the United Nations summit for the adoption of the post-2015 Development Agenda (resolution 70/1), which are key goals to guide a coordinated approach to Global Health. Handicap International is an independent international aid organisation working in situations of poverty and exclusion, conflict and disaster. Since Handicap International was founded in 1982, their work has benefitted several million people in more than 60 countries worldwide. Handicap International was a co-recipient of the 1997 Nobel Peace Prize as a founding member of the International Campaign to Ban Landmines which led to the signing of the Mine Ban Treaty. In 2011 theyr were awarded the Hilton Humanitarian Prize in recognition of almost 30 years of humanitarian action. Handicap International also received the 1996 Nansen Refugee Award for their work with refugees and victims of landmines. Instituted in 1954, the Nansen Refugee Award is given annually to an individual or an organization in recognition of extraordinary and dedicated service to refugees and is the most prestigious honour conferred by UNHCR. Handicap International is a Federation of eight National Associations: Belgium, Canada, France, Germany, Luxembourg, Switzerland, UK and USA. Together, they mobilise resources and manage projects around the world to support disabled and vulnerable people. Organizing educational seminars for local community physicians"
"Each year, over half a million people benefit from the compassionate and quality care of our Health Centers, Project Teams, and Residency Training Programs. Founded in 1968, MMI works in over 23 countries around the world. In 2014 we provided health care services worth US$177,519,522 to 668,475 people throughout the world who typically would have had limited or no access to medical services. Our business model is unique in that we utilize volunteers both medical and non-medical to bring life-changing services to the poor. We seek to eliminate a “welfare” mentality by asking that the patients contribute to their services. This contribution may be a little, but we have found over time that if someone has invested in their care, they will follow the doctors direction and get healthy. Gone are the days of people just throwing money a problem and then those who receive the gift tossing it aside because they think its not worth something." "Work the World provides highly tailored clinical internships across the developing world. Every intern's aim is different, so we tailor each and every aspect of your placement to your own individual needs. Whether you're interested in paediatric physical therapy in Sri Lanka, or geriatric rehabilitation in Kathmandu, we'll be able to create the perfect placement for you." "Founded in 1951, the World Confederation for Physical Therapy (WCPT) is the sole international voice for physical therapy, representing more than 350,000 physical therapists worldwide through its 112 member organisations. The confederation operates as a non-profit organisation and is registered as a charity in the UK." ADAPT (Chartered Physiotherapists in International Health and Development) is a Clinical Interest Group recognised by the Chartered Society of Physiotherapy in the United Kingdom of Great Britain and Northern Ireland. ADAPT will support members and facilitate information exchange in order to contribute to the development of culturally appropriate effective physiotherapy services world-wide. They work to do this in a way that promotes an understanding of healthcare in all cultures and belief systems and which is socially and economically appropriate. ADAPT members have worked or are currently working in many of the world's low and middle income countries, and have been involved in many Global Health Initiaitives in a wide variety of settings . The Global Health Division (GHD) was created in 2004 as a result of the growing interest in International Health by Canadian physiotherapists. The vision of the GHD is to be a reliable and influential resource and a strong advocate group for the importance of physical therapists in the area of global health. Focusing on countries with developing and transitional economies, the GHD facilitates access to a broad range of information ranging from global health and disability issues to volunteer opportunities. The GHD harnesses the passion, interests and energy of its members from across Canada and works in collaboration with colleagues from around the world. The mission of the GHD of the CPA is to educate, advocate and motivate physical therapists from across Canada regarding Global Health. 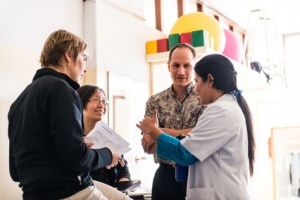 Canadian physiotherapists have been actively engaged in global health initiatives in a variety of settings on many of the world's continents. Some examples of these initiatives include the International Centre for the Advancement of Community Based Rehabilitation (ICACBR) at Queen's University supporting work in the Balkans among other countries, as well as at Dalhousie University whose physiotherapists have worked in Kuwait for a number of years. These are only a few examples of Canadian Physical Therapy organizations and universities, who have made an impact at the global level. These institutional examples are of course in addition to the numerous individual physiotherapists who have independently contributed to international health in various capacities. "Promoting Social Responsibility & Community Engagement at Home & Abroad"
"Mission: To provide resources, information, and support to SIG, Section, and APTA members regarding global health, health disparities, cultural competency, disability, and service-learning in resource-limited settings." "History: Ronnie Leavitt and Karin Schumacher co-founded the Cross-cultural and International Physical Therapy Interest Group in 1986. The group was officially recognized as a special interest group within the Health Policy and Administration Section in 1996. To reflect member interests in health equity, cultural determinants of health, and service-learning both in the United States and abroad, the group changed its name to the Global Health SIG." Discrepancy between current entry-level curricula, research and the most prevalent and/or serious region-specific health conditions. o For example, there is much focus on musculoskeletal (MSK) conditions in university programs and in research circles, yet such conditions are not a leading cause of mortality. In the statistics shown at the 2007 Summit, Ischaemic Heart Disease and Cardiovascular Disease were the first and second causes of mortality in four of the five geographic regions. Only Africa did not follow this pattern. There, the primary cause of mortality is HIV/AIDs, with Ischaemic Heart Disease and Cardiovascular Disease ranking 5th and 7th in the top ten, respectively. Accidents (including Road Traffic Accidents) were ranked the 7th leading cause of mortality in the Asia Western Pacific region, the highest position calculated for that category. Although Accidents can obviously result in MSK injuries, the rankings presented at the Summit relate to mortality thus the types of MSK injuries that physiotherapists typically see would unlikely factor in to these figures. Therefore, the disproportionate dominance of MSK conditions in regards to research and physiotherapy education do not seem to be in the best interests of Global Health. Others have proposed additional ways to enhance Global Health. “Voluntourism” is a term that has taken on a negative connotation because of the often disingenuous, condescending and ultimately short-sighted and ineffectual work that volunteers often perform in the name of Global Health. Even with the best of intentions, there is a risk of a negative impact to on the very community that the volunteer is trying to help. Appropriate reasons to volunteer include trying to form global partnerships and to learn from the opportunity (e.g. about historical and sociopolitical impacts on health or the role of rehabilitation professionals working in the area of global health). Inappropriate reasons include using the experience as a vacation or to look impressive on a resume. As well, it is important to understand the cultural context in which a volunteer will be working to avoid the expectation that he/she will effect fast or sweeping changes by knowing a ‘better’ way to do things. Following guideline or framework can help volunteers and organizations working in Global Health ensure the work they do is meaningful and socially responsible. An example of such guidelines can be found here. ↑ 2.0 2.1 2.2 2.3 2.4 2.5 Kickbusch I, Szabo MM. A New Governance Space for Health. Global Health Action. 2014 Feb 13;7. [Accessed: https://www.ncbi.nlm.nih.gov/pmc/articles/PMC3925805/]. ↑ Kickbusch I. Global Health Governance Challenges 2016–Are We Ready?. International Journal of Health Policy and Management. 2016 Jun;5(6):349. ↑ 13.0 13.1 World Confederation of Physical Therapists website. Available at: http://www.wcpt.org/. Last accessed 21/05/16. ↑ 17.0 17.1 17.2 Global Health Special Interest Group website. Available at: http://www.aptahpa.org/?page=GlobalHealthSIG. Last accessed 21/05/16. ↑ 18.0 18.1 Mohamud O for Africa on the Blog, part of the Guardian Africa Network. Beware the voluntourits intent on doing good. 2013. Available at http://www.theguardian.com/world/2013/feb/13/beware-voluntourists-doing-good. Last accessed 01/05/2016. ↑ 19.0 19.1 Beaglehole R, Ebrahim S, Reddy S, VoÛte J, Leeder S, on behalf of the Chronic Disease Action Group. Prevention of chronic diseases: a call to action.fckLRLancet. 2007; 370: 2152–57. ↑ Geneau R, Stuckler D, Stachenko S, McKee M, Ebrahim S, Basu S, Chockalingham A, Mwatsama M,fckLRJamal R, Alwan A, Beaglehole R. Raising the priority of preventing chronic diseases: a political process. Lancet. 2010; 376: 1689–98. ↑ Pechak CM, Thompson M. A conceptual model of optimal international service-learning and its application to global health initiatives in rehabilitation. Phys Ther. 2009; 89(11):1192-204. ↑ Bates AW. Teaching in a digital age. Available at http://opentextbc.ca/teachinginadigitalage/part/chapter-7-moocs. Last accessed 0105/2016. ↑ Mohamud O for Africa on the Blog, part of the Guardian Africa Network. Beware the voluntourits intent on doing good. 2013. Available at http://www.theguardian.com/world/2013/feb/13/beware-voluntourists-doing-good. Last accessed 01/05/2016. ↑ Seymour B, Benzian H, Kalenderian E. Voluntourism and global health: preparing dental students for responsible engagement in international programs. J Dent Educ. 2013;77(10):1252-7. ↑ International Centre for Disability and Rehabilitation, University of Toronto. Going for the right reasons: Is an ICI right for you? Available at http://icdr.utoronto.ca/students/students/going-right-reasons-ici-right. Last accessed 01/05/2016.